Crown Princess Mary of Denmark wears a pair of large statement earrings set with blue topazes and embellished with sapphires and diamonds. 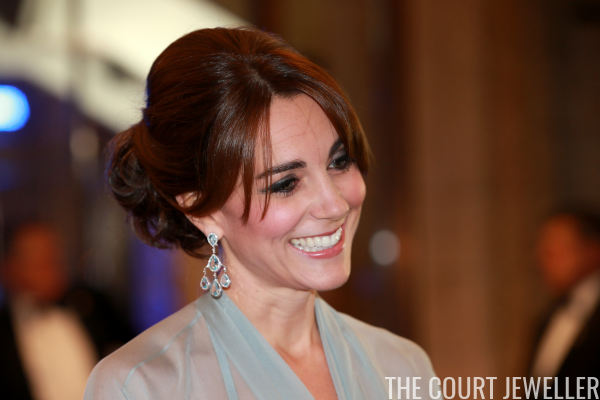 The earrings were made by Annikat, a jewelry firm that has featured more than once in Mary's jewelry wardrobe. Above, she wears the blue topaz earrings for the 100th anniversary of Copenhagen Business School in March 2017. 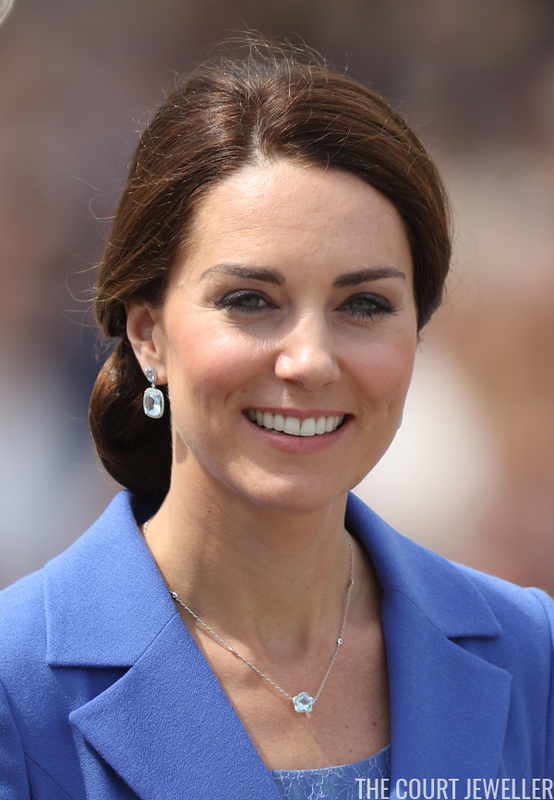 The Duchess of Cambridge is a huge fan of blue topazes, and her jewelry collection includes several pieces set with the stone. 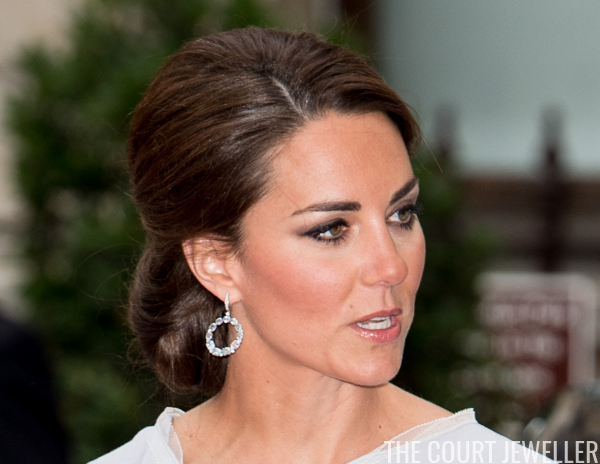 For a visit to Berlin in July 2017, Kate wore earrings and a necklace set with blue topazes; the jewels come from one of her favorite brands, Kiki McDonough. Kiki McDonough was also the creator of these striking hoop earrings, the "Lola" model, which are also set with blue topazes. The circle design of these earrings has made them very appropriate choices for events related to the Olympics. Above, Kate also wears them in July 2012 for a Creative Industries Reception at the Royal Academy of Arts. 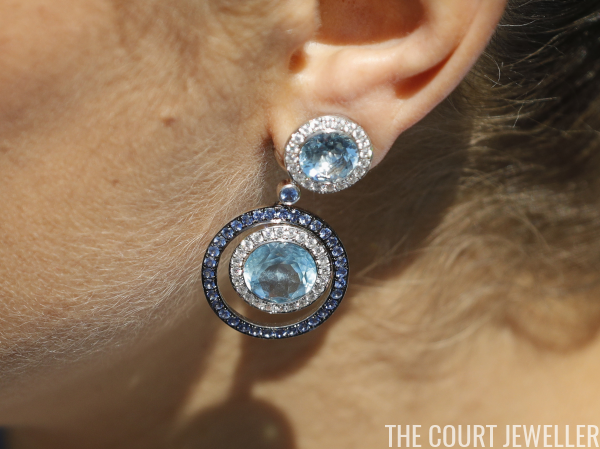 The Robinson Pelham Pagoda Earrings, also set with blue topazes, have been worn by more than one member of the Middleton family. Kate chose them for the premiere of Spectre in October 2015. 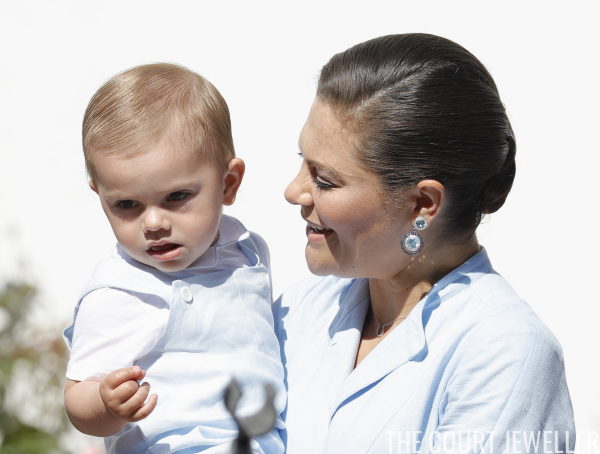 I don't have absolute confirmation, but I suspect that these statement earrings, favorites of Crown Princess Victoria of Sweden, are also set with blue topazes. Victoria has worn them for years, and recently she chose them for one of the events celebrating her 40th birthday in July 2017.